The imagination is a beautiful thing. I love mine. As a creative ADHDer; I see visions, images, and things that other people cannot see. If I don’t create, I get cranky. I’m happiest when the images flow through me and join to create something meaningful. I also need to be careful. This same creative imagination can harm me. When it runs wild, the lines between reality and creativity become blurred. That same imagination that I love can take my hand and pull me down a negative path and leave me there, all alone in the darkness. Negative thoughts run wild and manipulate the mind. Reality becomes distorted. Quickly, that distortion is believable. People with ADHD are magical thinkers. We love sparkly, shiny things. They are attractive and tempting. Sparkly things can lift you up into creative bliss; or they can have spikes and bring you down in a flash. If used for good- imagination is a gift- one of the greatest spiritual powers. If misused, it is one of the most dangerous. Here are some good thoughts to help you stay creative, calm, and happy. Ask yourself: Is this thought, image, or vision good for me? If the answer is yes; put on your oxygen tank, say goodbye, dive in deep and become one with your visions. (Please don’t forget to go to work, cook dinner, pick up your child, or go to the bathroom). If the answer is no; this thought, image or vision is not good for me, then grab the reigns and take control of your thoughts. 2. Take a PAUSE break. 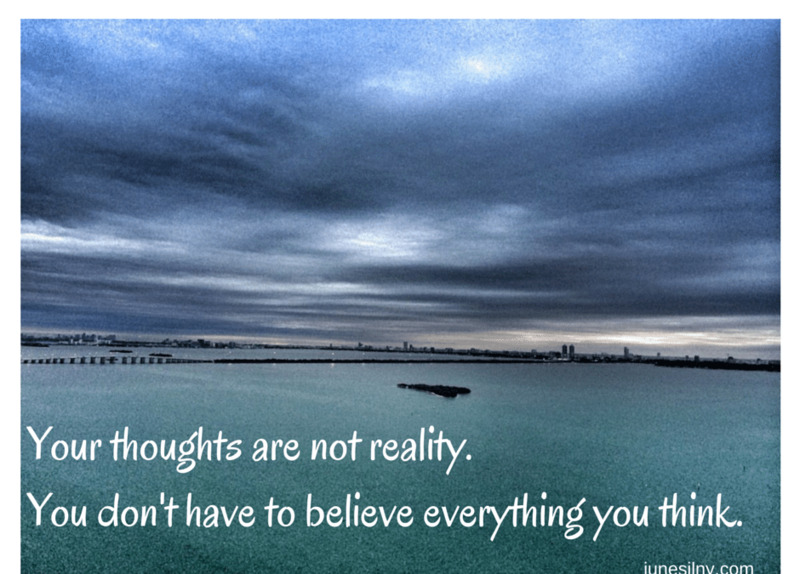 Give yourself a few minutes to create a break between your thoughts and reality. You can re-adjust your thoughts to be helpful, not harmful. Do not react (not easy but possible). Do not speak. Find a place in a quiet space. Pause and breathe. Just like you have to decide whether that old t-shirt is valuable memorabilia or too ripped to be fashionable, learn the difference between “trash or treasure.” Is it valuable and worthwhile or is it just another piece of junk you can’t let go of? Embrace the positive. Release the negative. 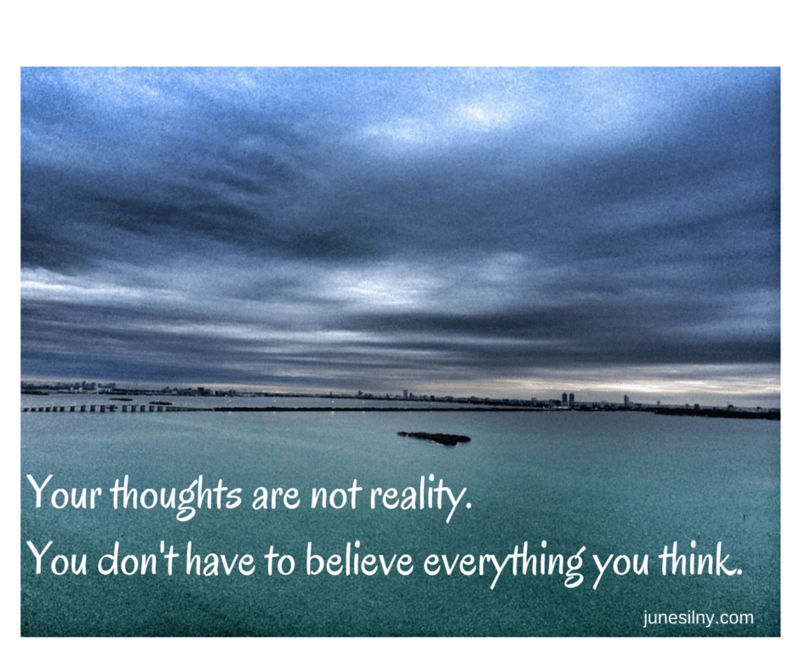 When negative thoughts push you out of the driver’s seat in your mind, you lose control. Worry, fear, guilt, and doubt take over. Erase and replace them. Start loving yourself by taking back the controls. Strengthen your good thoughts towards loving yourself. Be compassionate to yourself. Love your beautiful, creative, artistic mind- just don’t let go of the steering wheel or forget to use the brakes. Celebrate your beautiful mind and magical imagination. Such great advice! I have obsessive compulsive disorder and sometime my thoughts and “theories” take over my brain…I’m learning to embrace the most positive thoughts I have rather than the negative ones, if only because it’s healthier emotionally. Thanks for your wisdom! Thank you so much for taking time to let me know! I’m so happy you enjoy my posts.